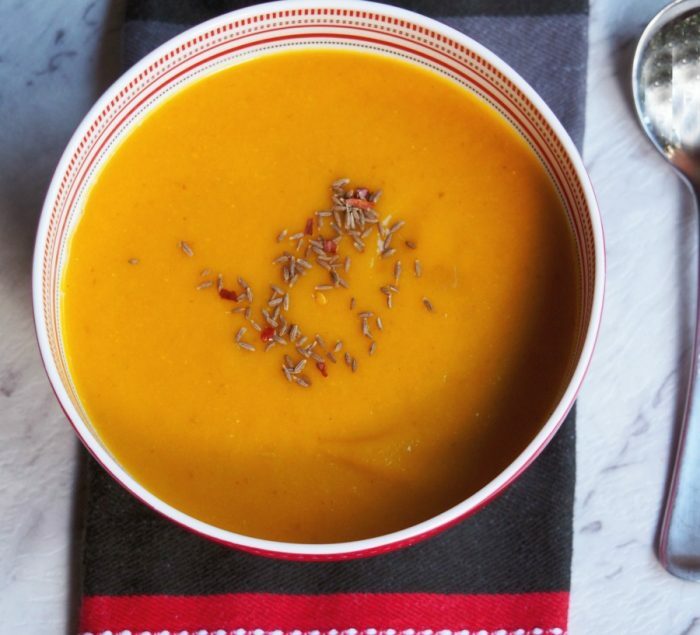 This delicious spicy soup is both hearty, healthy and low fat too. It tastes good and it’s good for you too. This recipe has had an extreme makeover, both in terms of words and pictures. 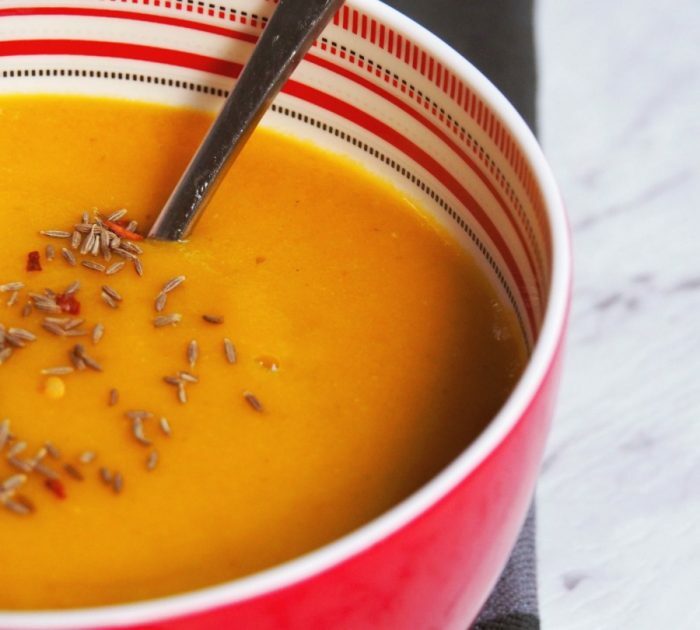 I used to make this soup in the slow cooker but to be honest, it’s so quick and so easy, I’ve found it easier to make it in one pot, either on the stove or in the Thermomix instead. Lately, I’ve been a very forgetful cook. 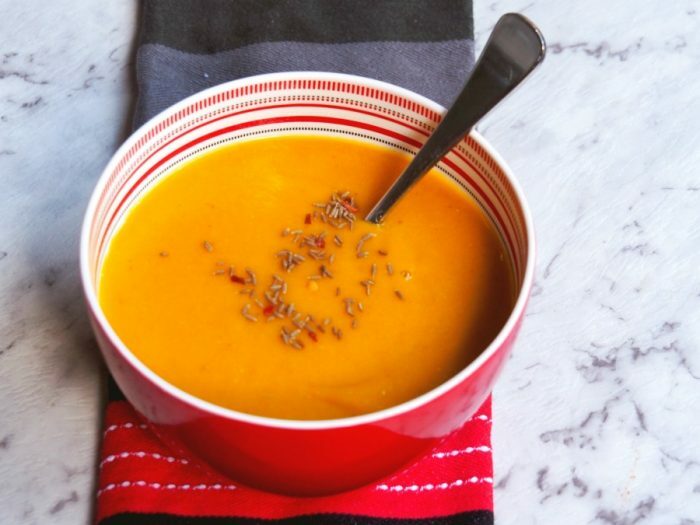 The other day I steamed some vegetables in the Thermomix but forgot to turn the temperature on and today, I went to make this soup only to discover I had forgotten to add the lentils! Doh! As if all that wasn’t forgetful enough, I borrowed a book from the library that I’d already read before but I didn’t realise until half way through. I’m taking solace in the fact that my doctor once told me that if you can remember that you’re forgetting, then there’s nothing to worry about! Here’s hoping that the burst of iron from this soup will give my brain a well needed boost! 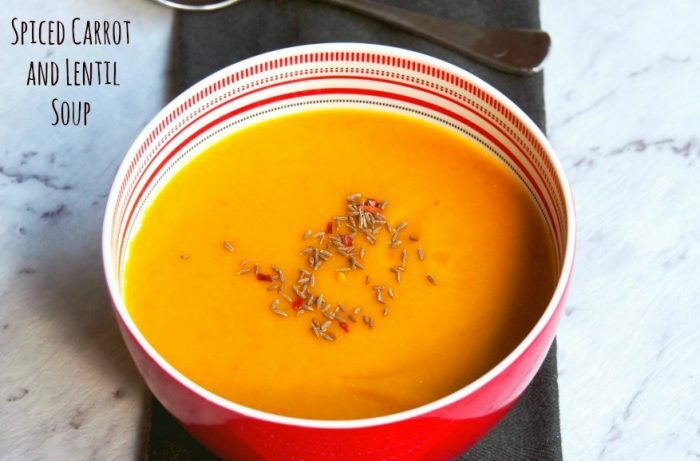 Talking of boosts, if you want to make this soup richer, creamier and prefer your soups thicker rather than thinner, try adding a little coconut milk at the end. Nom nom! Have you got a good memory? Are you a fan of one pot cooking? Heat a large saucepan and dry fry the chilli and cumin seeds until they start to jump around the pan and smell fragrant. Remove about half the spices and set aside. Add the oil to the pan and sautee the onion and garlic over a low heat until the onion starts to soften. Add the carrot, sweet potato, lentils and stock and bring to the boil. Simmer for about 15-20 minutes until the lentils have softened. 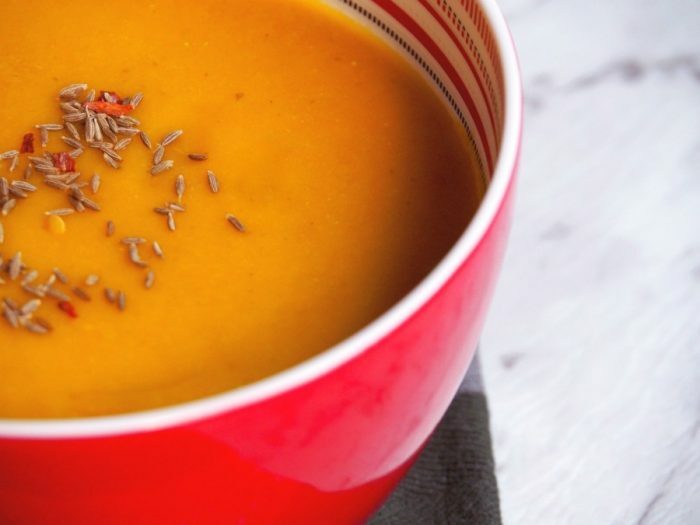 Whizz the soup in a food processor or with a stick blender. Add some milk if you prefer a thinner consistency. Serve sprinkled with reserved toasted spices, and a dollop of yoghurt, if desired. Place spices in TM bowl for 2 minutes on Varoma temperature on speed 1. Set half of the spices aside. Add onion and garlic. Chop 5 seconds on speed 5. Scrape down sides of bowl. Add oil and saute for 5 minutes on Varoma temperature on speed 1. Add carrots and sweet potato and chop for 5 seconds on speed 6. Add lentils, water and stock and cook for 25 minutes at 100C on speed 2. Blend for 30 seconds, slowly going from speed 1 to speed 8. If there is room in the bowl, add some milk if a thinner consistency is desired. Blitz again for another 30 seconds, slowly going from speed 1 to speed 8.